At about 10 a.m., Jordan AJ Nogo, 28, fired a shot from within his mobile home into the mobile home next door. No one suffered any injuries in the shooting, which occurred at the Los Robles Mobile Home Estates in the 60 block of Laguna Way. Nogo, who attempted to conceal a handgun in his clothing, fled in a black VW Passat after deputies arrived. Shortly after 2 p.m., deputies spotted Nogo, who they suspected of being suicidal, on Geneseo Road and attempted to pull him over. Nogo stopped his vehicle, but refused to leave his car. As a result of the standoff, deputies blocked off Geneseo and Union roads and sent a reverse 911 to residents in the area advising them of the situation. In addition, buses filled with children from local schools were rerouted around the area. Shortly before 4 p.m., Nogo stepped out of his car. Deputies arrested Nogo on charges of resisting arrest, being a felon in possession of a firearm, shooting at an inhabited dwelling and a probation violation. 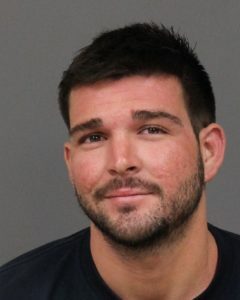 He is being held in the San Luis Obispo County Jail in lieu of $250,000 bail. Here’s another test for mental health in Parkinson’s jail.